I surprised my search came up empty on this subject. Using Audacity with Bodhi 5. When I put my mouse pointer on a slider and click to adjust one of the volume levels, a small window title bar appears and covers the slider so I cant see the slider anymore. As soon as I take the pointer off the slider it goes back to normal. Makes adjusting volume levels extremely difficult when you can't see what you are doing. Any ideas on how to stop this from happening? I have included some screen prints. The first one is before touching sliders and the others are after touching each of the volume control sliders. This issue could be related to GTK theme. Go to the Application themes settings and try to change the current GTK theme to another if help. We are working hard on themes maintaining these day. I created all GTK themes for each maintained theme. The issue is, GTK themes are in progress and we dont have GTK 3.2x support in BL 5. If you tell me the issue was solved with GTK theme changing, I will ask Ylee to make debs and you can upgrade your current theme to the right one. I can confirm this problem. It appears to be independent of GTK theme. On clicking on a slider toggle, it seems that the system pops up a degenerate dialog window, showing an empty title bar with the Audacity icon on the left and the X close icon on the right. There is no actual content in the window itself. This happens Seven theme with the Windows Vista GTK theme, and the default theme with Adwaita, plus a few other combinations I've tried. FWIW I've just tried Audacity on Mac OS X. On the mac, when you move the slider a little window pops up and displays: Output Volume 0.x, where the 0.x changes as the slider is moved. Yes, I can confirm the issue. Sth wrong with wxWidgets? I have no idea so far. Hmmm. 1. Double click on the volume slider, and a dialog window should appear. 2. Click on the close icon of the dialog. The offending blank window should still be present. 3. Click on the Audacity icon of the blank window, and select Window > Move. 4. Move the blank window to some harmless screen location of your choice. 5. Click on the Audacity icon of the blank window, and select Window > Remember. A Window Remember dialog opens. 6. Select basic mode in the Window Remember dialog (if you're not there already). Now you can move the slider freely. When you release the slider, the blank window disappears. When you click the slider again, the blank window appears at the remembered position, but disappears as soon as you release the slider. Ya the first thing I tried was upgrading audacity. Your thorough explanation was a little easier to follow as I could not quite figure out how to make it work last night. I tried all kinds of weird things like dragging it off the edge of the unmaximized window and then tried dragging it off the screen. Thanks to you I got it to work in an acceptable way. I might try going one step further and see if I can make that offensive little title bar go to the bottom of all other windows and stay there so I never see it. I guess for now this is solved as far as I'm concerned. Maybe next revision of Bodhi can address this. Audacity is a popular piece of software. Update: I couldn't get it to stay below all other windows but what I did is follow the bobl01 procedure then I dragged it to the ibar and stuck it there. It's not too distracting that way. Thanks all. I can confirm this is happening on Audacity 2.2.2 on ArchLinux+openbox, too. The only difference is that the offending window does not cover the slider area, but sticks to the top left edge of the screen and seems to be only 1x1px. other dropdown menus and text labels are also out of whack. on first glance i cannot see anything relevant on arch forums. audacity is written with wxwidgets? wxwidgets has caused me harm earlier, so i'd blame it on that, too. I have to admire your ingenuity. It seems simpler just to move the audacity main window. The little black pop up stays where it is at. At least it does here. Updating audacity does not help. I updated audacity to the latest commit in git. Compiled both audacity and wxWidgets for GTK+ as recommended by audacity/linux/build.txt. I made sure absolutely everything audacity needed was installed and there were no configure warnings at all. Moksha still has the same issue. Updating efl does not help. Same error in efl 1.21.1. This implies Moksha is not the only window manager having problems with this same issue. I can verify that the same issue persist in my Lubuntu 18.04 VM install. This is LXDE and I think is using the Openbox window manager. And as ondoho suggest the window is 1 pixel wide. I am not going to test and see which window Managers have the same difficulty. But it should be noted the splash screen does display correctly in LXDE. Well I am not going to blame wxwidgets. I like wxwidgets and it was the third GUI toolkit I tried to learn how code with. Never had any issues with the tool kit itself. But googling around I can find other apps that used to throw the same or similar .xsessionerrors. Most of them patched their code to avoid this 'height > 0' or sometimes 'width > 0' assertion failures. It seems something changed probably in gtk that made it stricter and apps started getting these warnings in stderr. This suggests if the audacity code was patched one could make that error go away. Maybe and most likely stuff would display right in Bodhi after that. BUT I am not blaming audacity. Err some window managers get this right. One still has the .xsessionerrors but the popup displays right. ... FWIW I've just tried Audacity on Mac OS X. On the mac, when you move the slider a little window pops up and displays: Output Volume 0.x, where the 0.x changes as the slider is moved. This is on e22 compiled on the same Lubuntu 18.04 VM install mentioned above with efl 1.21.1. 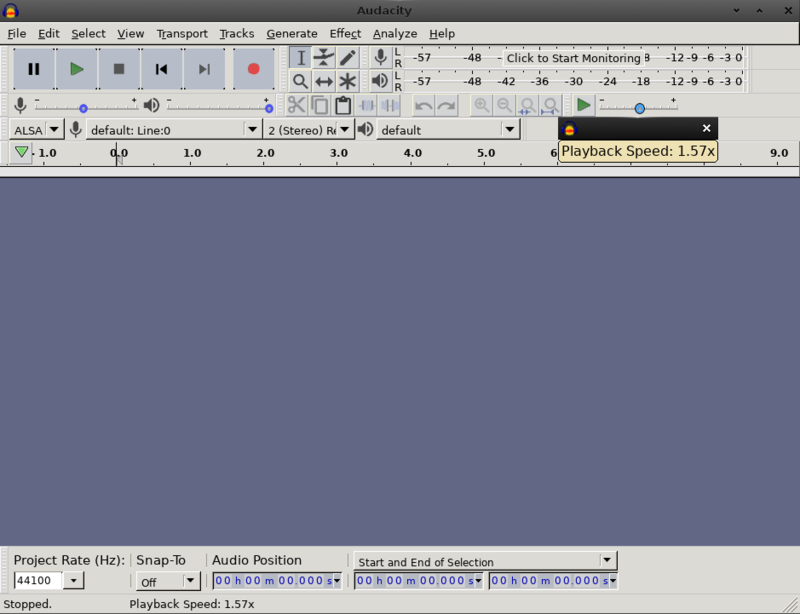 Note audacity fails to display this right in both lubuntu and Moksha compiled also in the same lubuntu VM. Also in e22 the splash Screen does display. It also fails to display right in e17 in the same Lubuntu VM. So to conclude I am taking this to mean we have TWO window manager bugs which have been present since before Moksha forked from e17 but has been fixed in latter versions of e.
wow - i wish i knew 1/1000th of what you know.... nice work man. too bad - i always thought it was a good app. this problem doesn't make it unusable. anyhow, i compiled audacity with wxgtk2 last night, and the issue is exactly the same. not sure what to make of it; i'd say i was too hasty to blame it on wxwidgets. it also doesn't seem to have anything to do with the window manager. then, when i actually hover over the slider and that weird window is created and destroyed, nothing. no output. i don't think this is window manager or gtk theme dependent at all, but i cannot test in VMs right now. ubuntu 18.04 offers audacity 2.3.0 as a snap package. did you try that, rbtylee? i did not mean it was bad stefan just a buggy thing. that was all. Thanks for filing this :D I see it was already a issue known to them, Bug 1534. I see it effects multiple window managers as suspected. It all sounds tedious. Any Ideas anyone? Even if the audacity devs fix this on there end and I repackage the application it is still an issue hidden until triggered by another piece of code doing the same sorta thing. As I mentioned above, googling around shows other apps which had similar errors but fixed it. ANy apps with similar errors around that have not fixed it or even don't know about it? A great unknown. more than 2 years old! so unity and e22 handle this properly, we are all just using outdated window managers? since unity is not ubuntu's default interface anymore, how is the new gnome handling this?